The Vice President of India, Shri M. Venkaiah Naidu flagged-off a Bicycle Rally and inaugurated Smart Cycle Station for Public Bike Sharing in New Delhi on 3rd June 2018. 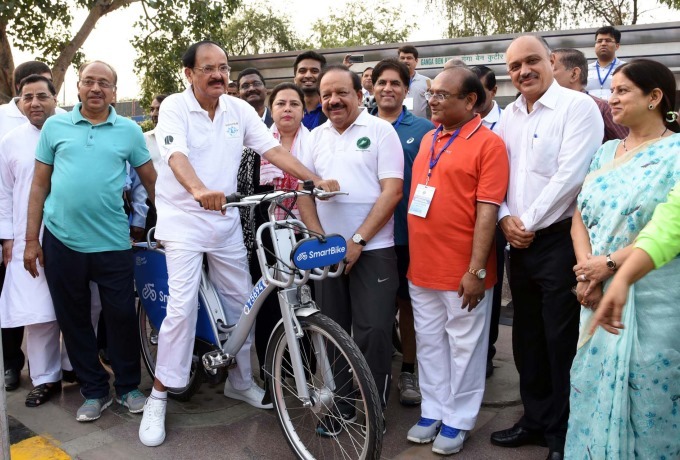 While addressing the gathering of cycling enthusiasts and environmentalists, Shri Naidu advocated that cycling is the best and cheapest form of exercise to keep ourselves healthy and people must be encouraged to adopt such environment friendly mode of transport. Environment Minister Dr. Harsh Vardhan, the Minister of State for Parliamentary Affairs and Statistics & Programme Implementation Shri Vijay Goel were among the other dignitaries who were present during this event and who supported the opinion of the Hon’ble Vice President. The Vice President further added that the campaign to promote the use of bicycle must be taken up on a sustained basis and it should not be confined to a ritualistic exercise around Environment Day. Highlighting the issue of rising pollution levels, the Vice President said that many cities the world over have virtually turned into chimneys due to pollution and the gases emitted from vehicles. He said that the time has come urban centres to promote bicycling in a big way. He also called for creating dedicated bicycling tracks in cities and campaigns for encouraging people to pedal their way to better health. “Apart from burning calories, strengthening muscles and promoting fitness, bicycling daily will reduce the risk for heart diseases and cancers,” he added. The Vice President also complemented the authorities of New Delhi area for starting Smart Cycle Station for Public Bike Sharing in the heart of the National Capital and said that similar initiatives are needed elsewhere in the country and the youth in particular must take full advantage of such facilities.